June | 2011 | Katie Simpson Spain (say it again). In July please visit Crow Arts Manor, part of Milepost5 in SE Portland, to see one of my paintings of plants. 850 NE 81st Ave. #114 in Portland. This space is awesome, and houses writing classes of all sorts. The group show my painting is in promises to be awesome! I’ve been super busy with 3 dayjobs, so not showing too much art lately – and I’m going to New York for grad school soon! Yes! I’m out of here in 3 weeks! I’m so crazy excited! I didn’t think it’d happen, really, so haven’t told that many people about it yet. But it’s happening. It’s real. It’s going to be a big move, I’ve been in Portland a super long time, so I feel funny about leaving. And leaving family & friends, and this beautiful coast. I’ll be back at some point soon though. I am really excited for some intensive artistic focus & professional development. And I am looking forward to learning how to be an art teacher, at a college level, as well as being in the center of the art world for a couple of years. I’m also selling a beautiful wood bookshelf, a fancy mattress and box spring (half a year old – firm pillowtop), a pretty vintage yellow dining table, wood and metal utility shelves, and a few odds and ends. And I’m giving away a few great things; including a lovely heirloom vintage couch with a wood frame – which needs to be moved by someone else and their friend, reupholstering, and a good home. A 4 1/2 foot tall wicker shelf thing. An amazing tall and thin studio shelf. A nightstand and end table that I painted up all pretty, and some other random goodies. Please please let me know if you are looking for anything in particular (just might have it for you) or are interested in the items I listed. Thank you for all of your support over the years! And thanks for your patience and help along this path. I will update you soon. I am excited for this adventure, and for the art that will come out of it. You can also follow my changes on my blog… I’ll make sure to give detailed reports. Happy brightness. Happy summer. Happy peak of light. Happy warm days. Happy dress weather. Happy watermelon. Happy zucchini flowers. Happy bbq. Umm. We’re doing it. We’re moving to NYC. My husband, cat and I. Soon. Very soon. I’ll be here for less than a month. Portland, sweet Portland. What a funny time. Leaving time. I’ve lived here for 13 years. Lucky 13. We’ll probably be back on the west coast soonish. We like it here. By soonish I mean years from now. A few years. Weird. Painting done! And new beginnings! 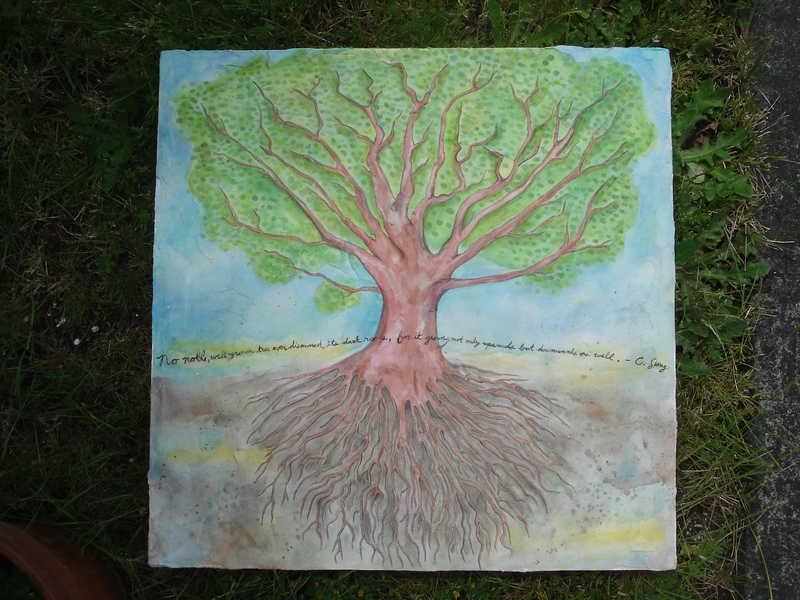 Sooo, below is a photo of the finished Jung tree painting. I have been so busy the yoga has taken a backseat. But I will do it again, for real. It’s so good! I’ve been working on the salad farm a lot! Extra! Things are going very well there, now that the sun has decided to come out (thank goodness. Last June was so rainy). Lots of planting and planning to do. I’ve also been working as a nanny, temporarily, for an awesome family. I’m working with 2 children, 1 1/2 and 3 1/2, who are sweet, smart and excellent. We draw, read, walk, garden, and do that other good stuff… like eating strawberries! And that gives me little time to sub at the preschool. Sad! I miss it there. I’ve had a few odd shifts, here and there, and I do have some scheduled work there. So that’s good. And I’ve been planning something HUGE and good! I’ll spill the beans in a different blog. I just wanted to update the commission progress, and other June type things. It’s nice here, in Portland, in early summer. It’s been cool and a little cloudy. Pretty much perfect weather. What a beautiful town Portland is. It’s changed so much since I’ve moved here. 13 years ago. It seems like such a long time. Well, it is. Anyhow, have a good night, people.